The tradition of outstanding defensive shortstops for the Chicago White Sox began with Luke Appling. He was the the cornerstone of the White Sox team, serving as their shortstop and leadoff batter for nearly his entire career. Like that storied tenure, this top list is a comprehensive collection of the best Luke Appling cards and stretches over two decades. Shop for Professionally Graded Luke Appling Cards on eBay. 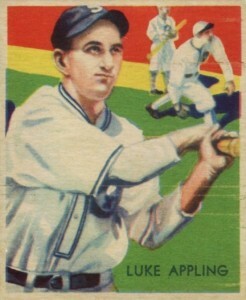 Luke Appling patrolled the infield for the White Sox from 1930 to 1950, and set many defensive records at the position. He became the leader in games played, putouts, and double plays by a shortstop. Fittingly, many of his records were eventually broken by another White Sox player, Luis Aparicio. Known for being one of the best contact hitters of his day, Appling won batting titles in 1936 and 1943, becoming the first American League shortstop to do so. His career year was in 1936, as he hit .388 and had a 27-game hitting streak over the course of the season. Like many stars from the 1930s and 1940s, Appling was included in the 1960 Fleer Baseball Greats set and the reverse side of his card mentions that Appling was skilled at fouling-off many pitches over the course of an at-bat. Two modern cards that have outstanding photography include his 1989 Swell Baseball Greats and 1993 Action Packed All-Star Gallery Series 2. 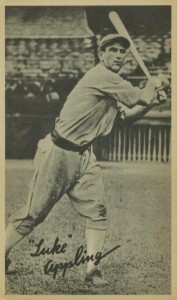 The Swell card features him holding the bat, possibly on the on-deck circle, and his Action Packed card has him sliding on the base path with his cleat headed directly for the camera. More recently, Panini issued some Appling jersey relic cards in their 2014 National Treasures set, including a combination relic with Stan Musial. 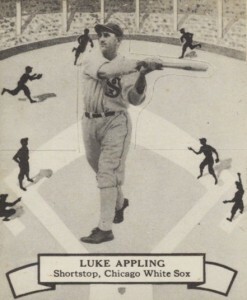 Luke Appling is one of the rare players whose career bridged the gap between the pre-war and post-World War II trading card industry boom. His trading cards vary from rare appearances in the 1930s to very popular appearances in Bowman and Leaf in the late 1940s and early 1950s. In building the list, a balance was applied between Appling's popular and valuable cards alongside notable options accessible to most collectors in trying to build a comprehensive collection. Although Appling played his entire career with a single team, he also coached for several teams and managed the Kansas City A's in 1967. 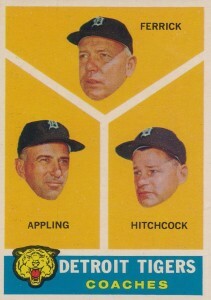 Topps included coaches cards in their 1960 set and Appling is featured along with the other Detroit Tigers coaches. 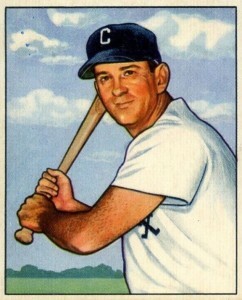 Many long-time coaches made their first baseball card appearance in the 1960 Topps set. Long before O-Pee-Chee became famous for reproducing Topps' baseball card designs for a Canadian audience, they created original trading card series of their own in the 1930s. The 40-card set begins with card #100 and only includes American League players. The backs have statistics in both French and English and the card was designed to be folded just like the 1934-1936 Batter-Up set. 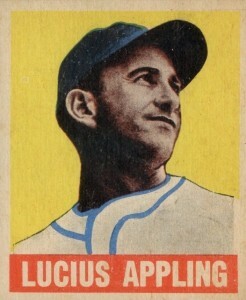 Appling's final card as a player can be found in 1950 Bowman and the reverse side reminds us of his unique nickname. Appling was often referred to as the "Old Aches and Pains" because of his habit of complaining about his injuries, as one would certainly do after two decades at shortstop. These large photo cards, which are stylistically similar to the Exhibits Salutation cards, were issued by Goudey and described as "wide pen" because of the thicker lettering used in the signature. Although the cards are unnumbered, Appling's card is often given the designation as #1 based on alphabetical order of the players included. 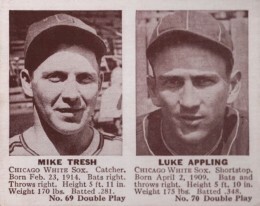 Appling is combined with teammate Mike Tresh on his 1941 Double Play card. Tresh was the White Sox catcher and Appling's teammate for 11 seasons. Although Tresh didn't reach the level of stardom of Appling, he did receive votes for American League MVP in two seasons. Although he died in 1991, long before certified autographs became a popular inclusion in baseball card sets, Appling was a frequent through-the-mail signer and many of those signatures have been made into cut autographed cards. The card below is from 2004 Upper Deck SP Legendary Cuts. The set offers many signature types from different color pens to black marker, giving collectors the chance to find the autograph that is perfect for them. 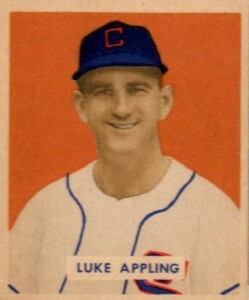 Appearing on card #95 of the Diamond Stars set, this Luke Appling card includes statistics from 1935. This means that his card dates from the end of the production and was most likely issued in 1936. The colorful art-deco background design makes the Diamond Stars set one of the most popular from the decade. 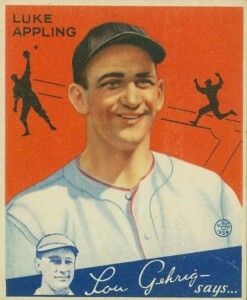 The background coloring on Appling's first Bowman card almost gives the impression that the photography on the 1949 Bowman card was actually in color. His photograph was sepia-toned, however, with portions of his jersey and background printed over the top with color. Although a few of his cards have his name as "Luke," with quotation marks included on the card (take another look at cards #5 and #7 on this list), his 1948 Leaf card puts his given name of "Lucius" right on the front in bold letters. The 1948 Leaf set is a personal favorite of mine and I particularly like how the cards almost have a political-poster feel to them with the large lettering and impressive photography. Although Appling had become a regular .300+ batter by then, he was not included in the 1933 Goudey set. Instead, he made his debut in the following season's set with Yankee legend Lou Gehrig providing commentary on his career on the reverse side. Gehrig notes Appling's ability to hit for a high average and he ultimately completed his Hall of Fame career with a .310 batting average.